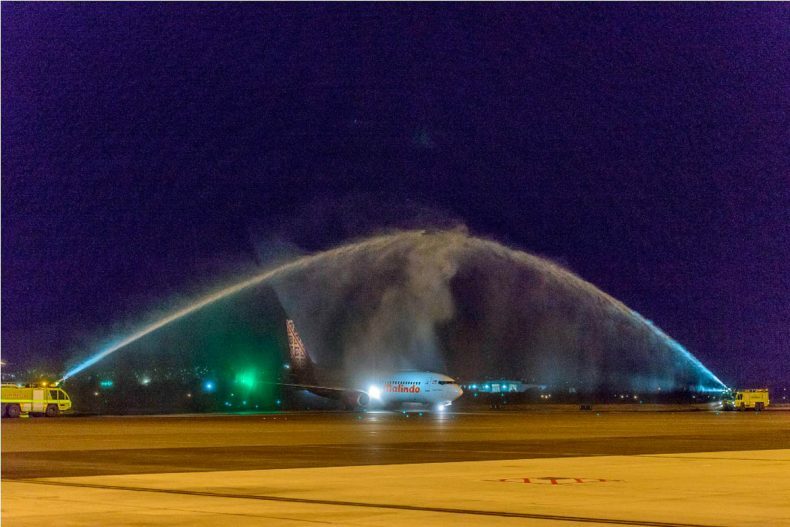 Malindo Air’s Adelaide inaugural flight landed in South Australia’s capital early this morning, welcomed by the traditional water salute. The arrival was celebrated with cake before the return flight departed for Bali and on to Kuala Lumpur. He added that, on top of the four weekly flights between Kuala Lumpur and Adelaide, via Denpasar, there are plans for more frequencies and new Australian destinations. …. Malindo Air will also be the first carrier since 2016 to offer a Business Class product directly between Adelaide and Bali. This service provides South Australian passengers with more choice when heading to two of our most popular destinations, and also creates opportunities to attract South East Asian visitors to our city and local attractions. Flights depart Kuala Lumpur to Adelaide, via Denpasar, every Sunday, Tuesday, Thursday and Saturday, returning the following day. The service uses a narrow-body Boeing 737-800/900 aircraft, offering 12 Business Class and 150/168 Economy Class seats. Promotional one-way fares are available starting from MYR 679 for Economy Class and from MYR 2,399 for Business Class. Book on the Malindo Air website, ticketing offices, customer care centre and preferred travel agents.